A program at Mt. Laurel’s Alice Paul Institute hopes to mold a new generation of female leaders. The Girlblazers Summer Camp gathers girls from all over South Jersey into one group to learn what it takes to be a leader. The camp includes activities combined with lessons about women who are known as leaders throughout history. Girlblazers is held only for girls who are entering fifth and sixth grade next school year. Claire Schmieder, the program associate at the Alice Paul Institute, emphasized the importance of the girls learning leadership qualities as they prepare to enter their teenage years. “We evaluate them pre and post camp, we ask them how they feel they are a leader,” Schmieder said. The camp’s participants are from surrounding communities. Some of the girls reside in neighboring towns such as Moorestown, Mt. Laurel and Delran, while many come from Camden. Bringing together students from different walks of life is part of the growing process at Girlblazers. With the girls coming from different backgrounds, the camp staff promotes a culture of acceptance and togetherness. The camp activities are a mix of field trips, activities at Paulsdale, the birthplace of women’s suffrage advocate Alice Paul, and lessons on women leaders from throughout history. Teaching the girls about women in history is essential at Girlblazers. Schmieder said some of the figures mentioned during the camp are people the girls never heard of before. The lessons about the women are tied into different activities to help build leadership and social skills among the campers. 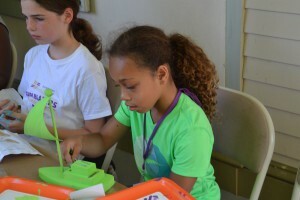 On Monday, June 30, the campers were making model boats together. They used wooden blocks to form the shape of the boats and painted them in a variety of colors and designs. The activity was much deeper than an arts and crafts project. The campers were very social during the activity, offering ideas and suggestions on each other’s boats. Being vocal and taking initiative with projects are just the first steps toward becoming a leader, yet they are essential in the eyes of the camp counselors. While Girlblazers is just the first step in the maturation of the campers’ leadership skills, Schmieder said the transformation from the beginning of the camp to the end puts the girls on the right path toward future success.